HD Asian Bistro receives a solid B. Why not an “A”? I’ll get to that. 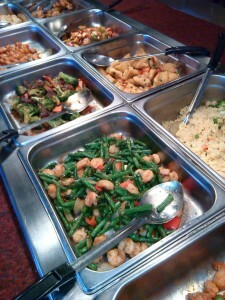 I was a little hesitant to try the buffet because buffets are often warmed up leftovers from the previous day. Not so with HD Asian Bistro buffet. 10 different dishes on their regular menu are offered. The dishes are varied so you don’t get the same selection every time you go. You get to try all of them for less than the price of one. Let’s start with the crispy green beans and shrimp — fresh crisp green beans that retain their color and crunch paired with sweet shrimp and a light sauce — very nice. Next the stir fried broccoli and beef, tender strips of marinated beef in a very lightly spiced sauce — just lovely. Kung Pao chicken is one of my favorite dishes and this version did not disappoint. Marinated chicken both white and dark meat with carrots, zucchini, onions, red and green peppers and peanuts in a mildly spicy sauce. I would have preferred more heat in the sauce, but then I like spicy food. Salt and pepper fish consisted of a delicate white fish in a light batter fried until the fish was just cooked through, not at all greasy or heavy. Don’t expect huge vats of food on the buffet. The food was replenished several times while we ate. I could hear the cooking going on and asked if they made small batches to keep the food fresh and the answer was yes. If you go in and you think that the buffet has been picked over, think again. Fresh hot food comes up quickly. I didn’t try the salad bar included in the price of the buffet, $7.99, but it did have some unusual items besides the lettuce and tomatoes including marinated seaweed, kimchee and minced chilies in oil. A dessert bar with fresh fruit, cake and soft ice cream is available. Okay why the “B” instead of an “A.” Several of the standbys were mediocre — not bad — just not special. For example, lo mein noodles and fried rice were more or less tasteless. The mini eggrolls didn’t have that crisp exterior probably because fried foods don’t do well in a buffet unless there is a fast turnover. The veggies inside end up steaming the wrapper. The hot and sour soup wasn’t spicy or sour, although it had a nice flavor. I did not taste the egg drop soup because I don’t particularly care for it. The décor is rather plain in a spacious dining room. That’s okay. The service was gracious. Now I know you’re going to ask why didn’t I ask for spicier Kung Pao chicken for example. I look at a restaurant as to how they handle their regular menu items rather than special orders. And about that menu, it is rather ambitious with probably more than 50 different dishes organized by chicken, pork, seafood, beef, rice and soups. I know that they offer the Vietnamese Pho.